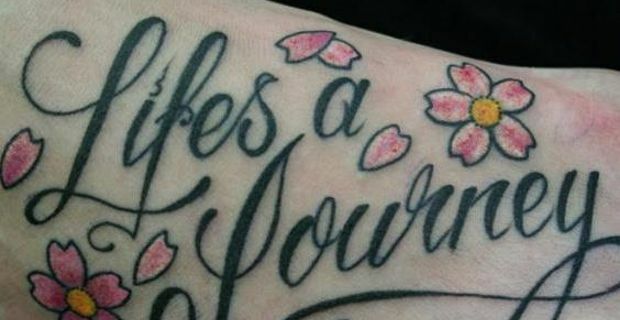 One of the fastest growing tattoo trends of recent years is lettering. With a range of classic and modern takes on fonts for all languages, tattoo lettering is definitely an up and coming trend worth exploring. Find out more in our short guide. Compared to the traditional tattoo designing trends, tattoo lettering is a relatively new art. Generally, for lettering we mean a a tattoo that is made up, entirely or in part, of letters, words, phrases and sentences. For instance, simple letters standing for the initials of a special person's name, a particular word with a powerful meaning, a rhyme from a favourite song or poem, something recalling a particularly important event. And apart from these, lettering form an increasingly integral part of tattoo designs, in a number of styles. Furthermore, a lettered tattoo may include many different writing styles and fonts. Retro, gang, bold, minimal or preciously enriched, every tattoo lettering has its ideal style, a special font that is the most appropriate. It all started with the classic, traditional tattoo writing trends like the Old English or Chinese lettering style, both quite ancient and both extremely popular ever since tattoo has conquered mainstream culture. Since then, an ever growing number of fonts and styles allows for as many different takes on this best loved kind of tattoos as there are individuals planning to get one! If you have an idea of what you would like to write, why not try one of the websites offering to check tons of different fonts: at http://www.tattoolettering.net/ for instance, you can generate your choice tattoo lettering in seconds! Try the different fonts, and choose the style that represents you better or better fits your original idea. Do you need tattoo-style fonts for your graphic designs? For endless inspiration there are online treasure troves such as 1001fonts.com that offer almost 100 styles of lettering for tattoos. Enjoy!